On Saturday, August 26th we flew to Kalispell Montana. Because we didn’t attempt to book lodging until four or five months before the trip our reservations were scattered around the park. Our first night we stayed in one of the tiny cabins in rising sun motor inn. We killed two black spiders before turning off the lights. Bites on my back the next day suggested we didn’t catch them all. The next morning we hiked to Saint Mary Falls and Virginia Falls. On the way there we saw a moose. Or part of one anyway. Off the trail, antlers jostled, the rest of the sleeping animal covered by bushes. We spent the second night at Lake McDonald Lodge, which turned out to be an even smaller cabin than the one at Rising Sun. But no spiders in attendance. Noisy neighbors sharing the wall made up for it. On Monday we drove to Logan Pass for the eclipse. However, the parking lot was full so we had to park a half mile down Going-to-the-Sun-Road. We tried both at home and in Montana to find eclipse glasses, but there were never any in stock. Without the glasses, the effect of the eclipse was little more than a very slight darkening of the sun. After the eclipse exodus we waited for a parking spot at Logan Pass and hiked to the hidden lake overlook. Unfortunately, with all the forest fires the lake and pyramidal mountain behind it were obscured by smoke. After hiking back down to the vista by the parking lot we were happy to see a travelling group (herd?) of rams. Monday night we checked into west glacier inn. On Tuesday after passing by the gorge and the trail of cedars we walked on through the woods to Avalanche Lake which, looks little like the photos we had seen. The fire’s smoke obscured the Röthbachfall-like backdrop waterfalls didn’t help. However, just to our left we saw a trio of black bears romping about before climbing a high pine for a nap. We took a break on the calm shore of Lake McDonald before heading back out of the park. We drove all the way to the other side of the park and up into the Many Glacier area on Wednesday morning. We intended to hike together to ptarmigan falls, but the elevation and exposure didn’t sit well with Sam. She turned back with the next group coming down and I took the bear spray the next four miles to iceberg lake. Once there I couldn’t help walking in until my feet went numb. I completed the 9.6 mile hike in just four hours including an hour at the lake to relax and stopping many times for photographs along the way. I rewarded myself with a pint of Gold Miner’s Hefeweizen, a tasty locally (to Montana anyway) brewed beer at the restaurant next to the trail-head and Sam and I shared a huckleberry beer from the adjacent gift shop. On our way out of the park we spotted a black bear frolicking in the stones above the roadway. We checked into Thronsons Motel in Babb, a place unchanged for decades. They had no internet, but a (satellite, I’m sure) television that only played HBO. The forecast for Thursday spoke of rain so we decided to take it easy and hike the mile-long wooded trail to Apukumi Falls. 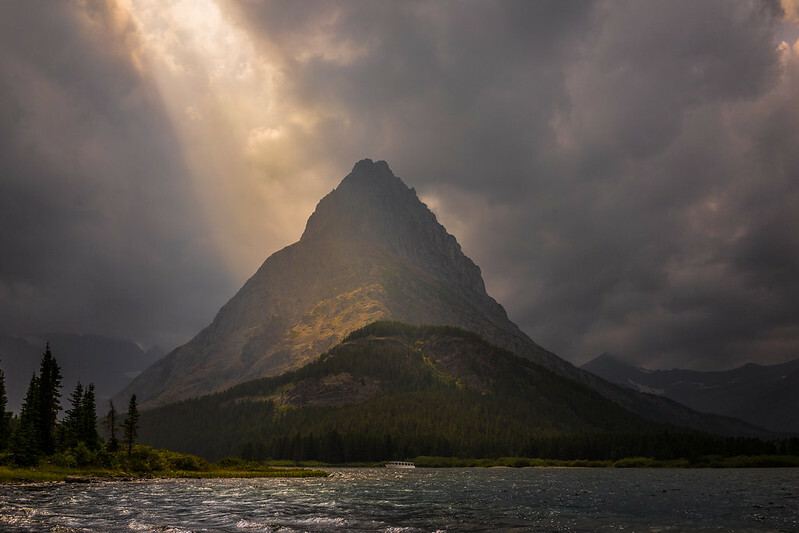 Afterwards we walked under storm clouds around the Many Glacier Hotel and down to the shore of Swiftcurrent Lake. After another meal (complete with Gold Miner’s Hefeweizen) I hiked the adjacent trail out to red rocks falls (3.8 miles round trip). While there a passing hiker said they saw a moose ten feet from the trail just a bit past the falls. I cautiously hiked out and just when I was about to give up I heard something chomping on leaves. For the next half an hour I stood in silence and observed a moose cow and her calf dine on the leaves just a few feet off the trail. They were aware of my presence and despite the calf crossing the trail and putting me between itself and its mother, I never felt the animus the park staffed warned about (“moose cows will trample and kill you if you get near a calf). Eventually it was me that moved on and headed back as I didn’t want to worry Sam, the moose presumably stayed there next to the trail for hours. On Friday we took the 11am boat over Swiftcurrent and Josephine Lake from Many Glacier to the Grinnel Glacier Trail-head. Sam wasn’t for the hike so she stayed on the boat. Ninety minutes later I’d scaled the 1500+ feet and 4 miles of trail to the most famous glacier in the park. At the “lunch stop” before the final climb I spotted a lone ram posing on the bare rock face overlooking the trail. At the top I put my feet in the water but found it even colder and much slipperier than iceberg lake as there seemed to be far more algae and far less icebergs. I ran back down the trail, eager to get one of the earlier boats back across the dual lakes and not leave Sam waiting. A ranger told me at one point that I’d blown by a family of Grizzlies higher up on the trail without even noticing. On the final mile hikers coming up told me a moose was drinking from the lake by the boat dock. Soon enough the trail bent around and I could see this for myself, as well as the next boat approaching. However, after running around the swamp to the dock to find no moose a man waiting for the boat told me kids threw rocks and scared the animal away. After eating at the lodge we drove back to the east glacier section of the park and took pictures at Sunrift Gorge and Baring Falls before checking into rising sun motel. On our last day we headed to Logan Pass again. Because of the rain on Thursday we hoped the view of Hidden Lake would be clearer. And it was! But we also had an up close encounter with a young mountain goat that wandered across the hiking path. When I hiked up alone a little beyond the lookout I encountered a large marmot grousing literally at my feet. After leaving the park we stopped in Hungry Horse for some purple (mom loves purple) huckleberry themed souvenirs. With a few hours left before we’d need to be at the airport we decided to check out one of the state parks. Lone Pine requires a parking fee, though, and we only had 30-45 minutes to spend (or so we thought) so we decided to skip it. Instead we parked across the street and took some pictures at Foys Lake. At the airport everything went smooth until boarding time came and went. And went. And went. Apparently there was an unspecified problem with the plane that required a mechanic. A mechanic that needed to be called in because there aren’t any on site on a Saturday at the tiny regional airport. We finally boarded the plane about an hour late. And waited. And waited. Eventually we were told that everything was fine but we were waiting on “paperwork” to be completed. Then “paperwork” turned into “we can’t find the ‘logbook’.” Another two hours later we finally taxiied back from the gate and were told we were only moving to make way for an arriving plane. Then they surprised us and said they could take off anyway. We arrived back at home in Los Angeles after 1am instead of the much more comfortable 8pm as originally planned. I would not recommend flying Allegiant airlines. However, this appears to be the only airline with a direct flight into Kalispell from Los Angeles, so they know they’ve got a captive (literally in our case, we were told we could not get back on the plane if we stepped off during the long delay) audience.